Player Y wins a match and is rewarded with two mystery boxes. He opens both. One contains 500 in-game credits while the other contains 250. Player Z wins a different, largely identical match and gets one mystery box. He opens it. It contains 750 in-game credits. All else equal, which player do you think is happier? Player A’s character dies and his ghost must spend gold to buy two items to get resurrected. The first item is magical paper that costs 1,000 gold. The second is a bottle of magical ink that costs 500. Player B’s character, which is of identical level and wealth to Player A’s, dies and his ghost must buy a resurrection scroll for 1,500 gold. All else equal, which player is more annoyed? If you presented those questions to a bunch of people, most of them would say that Player Z (who got 750 credits in one lump) was happier and player A (who had to pay 1,000 and then 500 gold) was more annoyed. This despite the fact that the total credits or gold in each scenario was the same. The only difference was whether the gains/losses were in one transaction or spread out over two. Behavioral Economist Richard Thayler conducted similar experiments with tax penalties and lottery winnings where he either lumped together or spread out wins or losses. He found that people like getting their gains lumped together and their losses spread out.1 This basic psychological fact is well established in the literature and has massive implications for game design. You start to see it all over when you start looking for it. Before we get into that, though, let’s set things up by examining a related and equally well known kink in the human brain, loss aversion. The short version is that losses are more painful than equal gains are pleasurable. Losing a $5 bill hurts more than gaining a $5 bill feels good. Along the horizontal axis you have losses and gains, with “zero” at the middle. 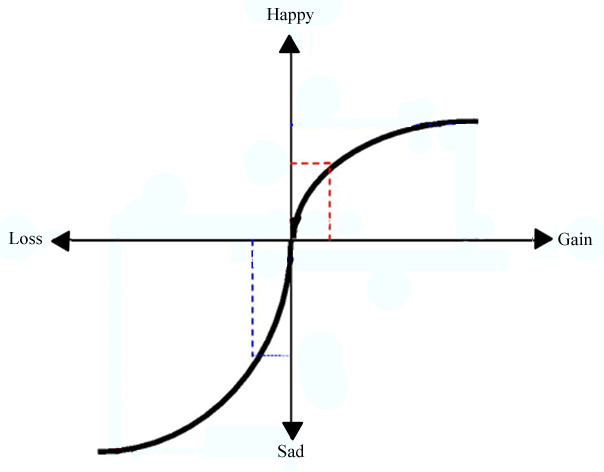 The vertical axis we can simplify here as increasing happiness (top half) or sadness (bottom half). If you plotted the happiness that would result from a certain gain you’d draw the dot right on the line as shown by the red dotted lines on the graph. Notice that the slope of the line is steeper in the losses/unhappiness quadrant in the lower left. That is, it takes much less loss to create a feeling of unhappiness that is equal in magnitude to the corresponding happy gain. Unhappiness plummets with only a little loss relative to how much gain is needed to create an equivalent amount of happiness. This is loss aversion. Because of this, we will put in more effort to avoid a $5 loss than we will to get a $5 gain. It also means that we will shy away from risks more if it means losing versus gaining money. And it’s not just something nice and easy to measure like money. Loss aversion applies to experiences, objects, and anything else that has value. In the realm of video games, that would include points, ranks, in-game currency, and lots of other things. But you can really make things interesting when you start combining or bundling gains and losses. Since we give losses more weight, a 300 experience point gain paired with a 100 experience point loss does not feel like 300 minus 100. It feels closer to zero because the 100 point loss looms so large. But wait, there’s more to it, because the values we attach to gains and losses also exhibit diminishing returns as they increase. To illustrate this, consider this situation, inspired by a classic experiment on the law of diminishing returns (or diminishing costs). Imagine you’re contemplating the purchase of an upgrade to your agility stat for 15 gold. Looking at a FAQ, you note that the same upgrade can be bought for 10 gold at a different vendor several zones away, but to get there would take you about 20 minutes. Would you make the trip to the other vendor? Imagine you’re contemplating the purchase of an upgrade to your endurance stat for 1,250 gold. Looking at a FAQ, you note that the same upgrade can be bought for 1,245 gold at a different vendor several zones away, but to get there would take you about 20 minutes. If you had experienced this version of events instead, do you think you’d be any less likely to spend 20 minutes saving 5 gold (or dollars)? Probably so, because we tend to start getting less touchy about losses and gains as they get more extreme instead of thinking “Is 20 minutes worth 5 gold?” in either situation. Notice that the curve in the upper right flattens out, the values of two points a quarter of the way up the “Gains” axis side of the horizontal axis add up to more happiness than just one point twice as high on Gains. Two gains of five add up to more happiness than one gain of ten. That’s nice, so we want things doled out to maximize “happiness” Similarly, looking at the lower left part of the diagram, two points a quarter of the way over on the “Loss” end of the spectrum add up to more than one point halfway over. That’s bad, so we want them bundled up to minimize our face palming. Okay, here’s the important part that relates to the two hypothetical examples that started this blog post. Diminishing anger towards losses and diminishing joy from gains means that we like it when gains are spread out and prefer it when losses are lumped together. And diminishing sensitivity means one big loss of 1,200 points feels like less than three separate losses of 400 points each. Smart game designers know this, even if they never touched a psychology textbook. It’s the reason why after reaching the end of a challenge in one of the Assassin’s Creed games you find not one big treasure chest, but many small ones. It’s why you often get to visit multiple trainers, vendors, and screens to spend the upgrade points you get when you level a character up. It’s why Dead Rising 2’s Chuck Green gets combo cards and little bumps to abilities at each level instead of drastic improvements every five levels. And it explains why hitting a minimum level requirement to don a bunch of new armor is so exciting –each greave, gauntlet, and codpiece is a separate gain, not to mention a visual upgrade to your character model. The practice of bundling losses together to maximize player happiness is harder in modern games, but it does happen. It’s also interesting is to ponder games where designers don’t want to minimize the unhappiness associated with failure, and so they spread losses out. World of Warcraft’s resurrection sickness saps all your attributes as well as your damage potential by 75%, making it more of a bummer –not to mention damage to all your equipment. So the next time you gain a level, upgrade your weapons, or get a reward for completing a quest, take a moment to ponder how loss aversion and diminishing sensitivity may have impacted how things shook out because of our imperfect human brains. Thanks, imperfect brains! 1. Thaler, R. H. (1999). Mental accounting matters. Journal of Behavioral Decision Making, 12(3), 183–206. Wow! As I was reading I was visualizing every example on every game I have played: the gains spread out, the feeling of losing and winning (and how proportionately different they between them), how every loss is compensated. I think will enjoy and appreciate video gaming even more just by reading this article. THANKS!! Overall, really interesting post. Slightly confused about the beginning example and the Thaler citation: Thaler (along with the rest of this post) appears to recommend segregating gains and grouping losses. Doesn’t this correspond to the two-box scenario and the 1,500g lump payment (the opposite of what is written above)? I thought winning 2 lockboxes, 750 credits is better than 1 lockbox 750 credits, which fits the theory of incremental gains than 1 big chunk of gains for a happier player. (1) Segregate gains (because the gain function is concave). (2) Integrate losses (because the loss function is convex). (3) Integrate smaller losses with larger gains (to offset loss aversion). Based on Thaler’s work, you should give players a big reward and then spread out losses. Best example is slot machines, where each spin is a small loss but you play for the big wins. I think for REWARDS like items and gold/money the Thaler’s experience makes sense, players feel more excited when receiving a big prize when the odds low (the “I am lucky” feeling) and probably don’t mind paying small amounts when trying to do so (for example paying or using items trying to craft something or when buying a bag with random goods). But when it comes to LEVELING (like the name of the article suggests) the opposite actually makes more sense, players don’t want to be doing quests and killing monsters to just have a chance of getting a big amount of experience (they want to feel like they are progressing so might not feel ok with the risk factor for leveling?). And for a big loss the “loss aversion” might be more manageable (like explained in the graph) rather than having small losses of experience and items/gold many times. But I did got confused as well, part of the article seemed to contradict itself.